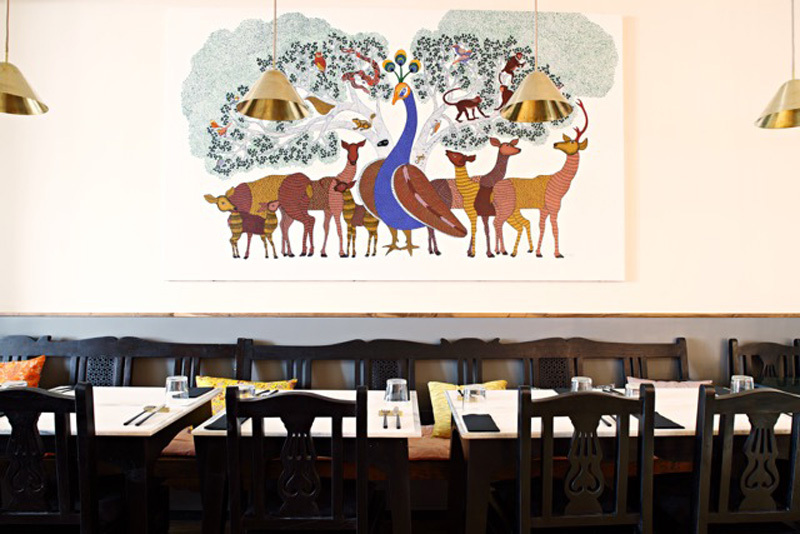 We have customised paintings for a restaurent called “Desi Roads’ In Paris.The paintings were done by artist Manoj Tekam.It was a challenging project as the owner Stephanie wanted refined look , yet in a Gond style. The painting is inspired by the Tiger Sisters of Telia Lake, in Tadoba-Andhari tiger reserve in Chandrapur Maharashtra. Tigers are known to be solitary animals preferring to hunt on their own, however a group of four tiger sisters have proven otherwise. Having to face survival challenges, they started hunting together as a pack. This trait has never been witnessed before. The painting shows the four sisters leaping. The composition depicts the first tiger vertically aligned on the canvass, whereas the remaining three occupy a horizontal placement. 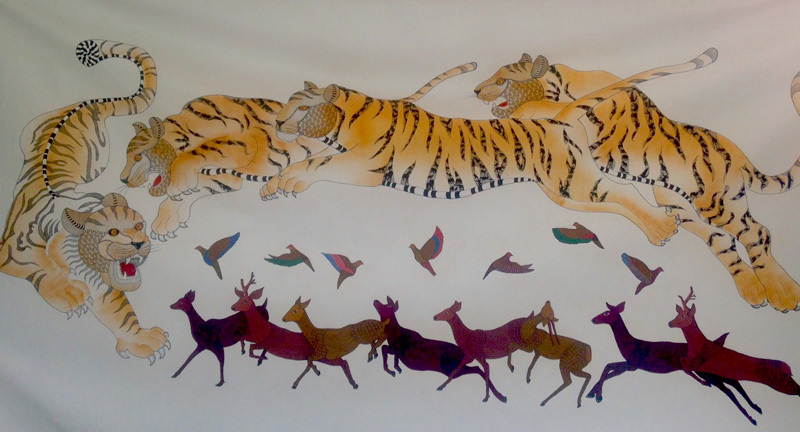 A herd of deer are shown running towards the first tiger, as if the whole ambush was planned, and the deer seem to be trapped. The Peacock is the national bird of India. In the painting the peacock represents mother earth ( Gaia). Its tail is depicted by the ‘ Tree of Life’. The tree is shown with a variety of animals it shelters and sustains. A synergy exists between these creatures, symbiotic, competitive or predatory which ever the case may be. For example the owl watches the snake as it stalks the squirrel. The painting depicts the fine balance of our ecosystem and mother earth as nourisher, sustainer and a giver of life. This painting was done for a French national ,she and her husband are wildlife enthusiasts and travel to the national parks of India every year.